This classic roast turkey will be easily be the center of attraction at your holiday feast. Remove thawed turkey from bag. Remove giblet package from neck skin area. With legs facing away, press one leg down near leg clamp to release. Release other leg. Do not remove clamp from turkey. Remove neck from body cavity. Rinse inside and outside of turkey with cold water. Drain well and pat dry. If stuffing turkey, allow 3/4 cup stuffing per pound of turkey. Bake any extra in casserole dish. STUFF IMMEDIATELY BEFORE ROASTING. Re-tuck legs in clamp. Roast immediately. Place turkey in roaster or in shallow pan with rack. Brush turkey with vegetable oil. Roast at 325°F according to chart. It is not necessary to baste your Honeysuckle White turkey and opening the oven door will slow cooking time. Using a meat thermometer is recommended. Insert into the thickest part of the breast without touching the bone. Thermometer should read 170°F / 75°C when turkey is done. Start checking pop-up timer and meat thermometer 1 hour before turkey is due to be done according to chart. 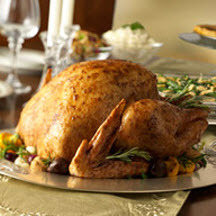 When turkey is golden brown, cover with a loose tent of aluminum foil to prevent over browning. When timer stem pops up, your turkey is perfectly cooked (meat thermometer should read 170°F / 75°C). Alternative checks for doneness: leg joint moves freely when the drumstick is rotated; or, when a fork is inserted into the deepest part of the leg joint, the juices are clear. Remove turkey from pan to serving platter, reserving dripping in pan for gravy, if desired. Let turkey stand 10 to15 minutes before carving, to allow juices near the surface of the skin to be redistributed, for juicier meat and easier carving. Make gravy during standing time and garnish turkey with fresh herb sprigs, if desired.